At the end of January, I wrote a post called “Looking Back on January.” It was a report card of sorts designed to keep myself accountable to my goals. I will be doing this every month as a way to not only stay accountable, but also to be able to look back and measure my progress. This area was the most vulnerable to falling back into my old ways as the routine of walking would no longer be a novelty. But I was determined to continue the work that I started in January, although I didn’t do as well as I had hoped. Not to make excuses, but I would have never guessed that my walk would have been snowed out for three straight days in Texas. Even when the snow stopped, the roads were still covered as there is no mechanism in place to deal with the winter days that I am accustomed to as a native New Yorker. It turns out that this has been one of the snowiest winters in the history of this area. I missed my walk on one of the days due to the residual pain caused by a visit to the dentist in the afternoon. Not only did I miss my walk, but I also turned down free tickets to a minor league hockey game (which is something that I would never do if I was feeling up to going). The last missed day came today, although I did manage to get in some physical activity by playing football with my son. No regrets over skipping today though. The time spent with my wife and kids at the park and the playground was well worth it. So, the final tally was 21 out of 28 days walking. Not bad, but not as good as I had hoped. March will be the month when things start to kick into high gear, so next month’s update should show improvement. As I stated last month, the simplest way to determine my success in this area is by measuring my income. However, I don’t think that using money as a measuring stick is a good idea because it fails to take into account actions that I have taken to build towards the future. Things did improve overall, and some real progress was made on one venture in particular. In fact, the progress made in February may very well lead to taking a major step forward by the time that March comes to an end. More information about this will follow in the near future. Progress was also made with another potential business venture, and plans are in the works for further discussions during March as well. Should this work out, it could be another very positive step in the right direction. As I reported last month, one project was still in the “ready to launch” phase. It is something that has a lot of long-term potential, but it had to remain on the backburner for just a little while longer as the other projects consumed a lot more time during the month. Since the project that is waiting does not have a strict deadline or other people counting on me directly, it was the most logical one to delay. As I mentioned last month, I am looking forward to getting it off the ground, and sharing it with others as soon as possible. My goal for March is to make enough progress with the projects that I am working on to officially take them out of the planning phase and into the implementation phase. Two months in, and my feelings about 2010 remain as positive as they were on New Year’s Day. While my pursuit of health remained steady (at best), I did take steps to ensure that March is going to provide meaningful progress. I also made significant progress on my business ventures in my pursuit of wealth. And while it is still too early to translate into revenue and income, there is a light at the end of the tunnel. Although February was much busier than January, I did manage to keep Waldo2010 updated with as much new content as possible. And fortunately, the posts that I deemed to be the most important were the most well-read of the month. Once again, the closeness, the love and the laughter that is my family and my home, ensures that any bad moments are easily overshadowed by the good. As I head into the month of March, I already know that there are going to be some bumps in the road on a personal level. But I also know that there are positive moments that lie ahead, both personally and professionally, so there is something to look forward to. The sky is a flawless blue, unencumbered by even the hint of a cloud as I sit here pondering the significance of the end of February. Actually, the end of February has no intrinsic significance other than it means that March is about to arrive. March hasn’t been easy for me for several years now, because it forces me to once again celebrate my dad’s birthday without him here….all the while thinking what might have been instead of what is. It is said that “March comes in like a lion and out like a lamb,” a reference to the demise of winter and the commencement of spring, and the brighter days that accompany it. Usually March’s lion begins for me as my father’s birthday approaches and ends once the day has passed. But not this year! The lion will roar early this March on the one-year anniversary of my grandmother’s passing. Before I get the chance to catch my breath, my father’s birthday will be upon me, which will be more painful than usual. For the first time since his passing, I will not be at his graveside to acknowledge his birthday. Although I know that he knows that I’ll be there in spirit, it is difficult just the same. And while the day after his birthday is usually the beginning of March’s lamb for me, that is no longer the case. This year, I’ll be waiting for the next wave to come crashing down as the one-year anniversary of the passing of our family dog closes out the month of pain. (I’ll be writing about each of these separately). Of course, life is short, and there is no time for a month’s worth of wallowing in what I have lost. It just so happens that March may very well be the month that marks a new beginning for me. A month when dreams start to materialize into reality as the seeds that were planted long ago finally start to blossom. Maybe it is just coincidence, or maybe good things happening in March is a way of counterbalancing the painful reminders of what I have lost. Whether we like it or not, we don’t get the chance to compartmentalize our pain into specific time periods and then thrive during the rest of the year. Each month is filled with good times and bad times. It’s just the way that life is. Some months, the good times will far outweigh the bad. Some months, the bad times will take center stage and overshadow the good. If we’re lucky, there will be many more good months than bad ones….many more good times than bad times. For many people, the convergence of winter and spring is more about the weather than anything else. If not for key dates in March, it might be the same for me. But it’s not. I know all too well already about the lion that I am about to meet as the calendar flips to March. What remains to be seen is what the lamb has in store for me. Life today is infinitely busier than it was when I was a kid. Perhaps it is because I am an adult with responsibilities, or perhaps it is because the simpler days before the technology revolution left us with more time to live in the moment. So much of our life nowadays is spent planning for things that we are going to do in the future that the present tends to get short-changed. And though we don’t give it much thought…time marches on while we continue to make plans for the future. By this time next week, I’ll know if the lemonade turned out to be a cold drink on a hot summer’s day, or something that was too sour to swallow. If it turns out to be the former, it will be a step in the right direction as I travel down the road in my pursuit of wealth. If it turns out to be the latter, I will continue making more lemonade until it suits my palate. Things aren’t usually as bad as they seem when you take a moment to think about them. Life is going to throw you curve balls. How you react to them is the most important thing. No plan is perfect, but good ones can overcome challenges when met with creativity and desire. And finally, lemonade metaphors make you thirsty! Social networking has afforded me the opportunity to get back in touch with people who, quite frankly, I probably never would have found on my own. My friends list on Facebook is nothing short of a virtual version of “This is Your Life.” The list ranges from people who have actually known me since birth to people who I’ve never seen face-to-face (or even spoken to on the phone for that matter), and everything in between (people from elementary school, junior high, high school, camp, jobs, etc.). Like rafts adrift on an ocean, old friends were each pulled in different directions as the years passed, but somehow, we all ended up on the same island many years later. But that doesn’t mean that everything is the same as it once was. For some, the lost years never seemed to have happened, and the relationship picked up where it left off in an almost seamless way. For others, landing on the same island did nothing to bridge the gap of the years gone by, as friends of the past became nothing more than familiar strangers. It really is a matter of circumstance, as each of us has changed in our own way. Although we may wax nostalgic about the good times that we shared in the past, it doesn’t necessarily mean that we always have enough in common as time goes by to rekindle old friendships. By the same token, the common bond that we once shared can also become a foundation on which to build new friendships with people who (at one time) were nothing more than casual acquaintances. Common interests, beliefs and mindset are still the ties that bind people together. In the past week, I have had two meaningful conversations with people from my past. One was a former co-worker (and friend), and the other was a friend that I’ve known since I was a kid. Although I had spoken to each of them on a rare occasion, I hadn’t spoken at length to either one of them in a very long time. While I knew what they were doing at one time, I only recently learned about what is going on in each of their lives now. My former co-worker and I always had a strong bond. We were friends as much as co-workers, even though our backgrounds and lifestyles were very different. And though we stayed in touch for a while after we stopped working together, we lost touch as I got married, had kids and moved back to the suburbs. He stayed single, has always lived in the city, and his socializing for both business and pleasure has never diminished. Despite our lifestyle differences, our phone conversation confirmed that we are of one mindset. I am looking forward to seeing the projects that he is working on succeed, and he feels the same way about the things that I am working on. It wouldn’t shock me at all if we worked together again in the future. In my conversation with my childhood friend, I found out that the ties that bind us go well beyond the experiences that we shared in our carefree youth (in both good and bad ways). Both of us lost our fathers way before their time. Both were men of strength when they were alive, and unfortunately, both of our fathers left this world when their strength was tragically taken away from them. I had a short time to say my goodbyes, my friend had longer. Each of us felt terrible for what the other one had gone through in losing our dads (the men largely responsible for who we both are today). Neither of us will ever feel as complete as we once were when our fathers were alive. And though my friend didn’t say as much, I can tell that he wants to be to his kids what his father was to him. The words didn’t need to be spoken. It is easy to see it in others because I feel the same way about my kids. Throughout our lengthy (long overdue) conversation, we reminisced about the old days, touching on as many of the good times as we could, although we certainly couldn’t fit them all into one conversation. One memory stood out above all others because it apparently had more of an impact than either of us realized at the time (or for the years that followed). Only recently was the magnitude of our last day of high school revealed to my friend by a former faculty member who shared a perspective that neither of us could have possibly imagined. Suffice it to say that one of the greatest days of my life was elevated to legendary status upon hearing about my friend’s enlightening conversation. It is very hard to look beyond the moment when we are young, especially when we seemingly have our whole lives in front of us. Most of us thought that our childhood friends would be lifelong friends because we didn’t have the foresight to realize that things and people change. However, our adult lives are guided as much by circumstance as they are by our intentions. As a result, some friendships stand the test of time while others do not. Billy Joel said it perfectly many years ago…“so many faces in and out of my life…some will last, some will just be now and then.” Without a crystal ball, it’s difficult to tell which faces will last, which faces will be now and then, and which faces will be nothing more than a memory. I had no way of knowing that my friend and I would lose touch for so many years. I had no way of knowing that we would be of the same mindset as fathers as we were growing up together. Maybe it is because we both tragically lost our fathers. Maybe it is because of the influence that they provided when they were still with us. Or maybe it is a combination of both. I also had no way of knowing that we would be able to reminisce about the “good old days” in one breath, while admiring each other’s work in the next. What I do know is that the ties that bind us as adults have the potential to be stronger than the ties that bind us when we are young. Being nostalgic by nature, I do have regrets about the lost years with certain people. But I also have a great appreciation for the opportunity to reconnect and make up for lost time. I can’t help but wonder what my life would be like today without the modern technology that has made melding our past with our present so effortless. Gray clouds blanketed the morning sky as I set out on my daily walk today. The chill in the air, the overcast sky and the lack of a good night’s sleep made the beginning of the walk feel like an arduous task. But as I started to get warmed up, my appreciation for the solitude of the desolate streets transcended my desire to go back home and crawl into bed. Most weekdays, I walk towards the end of the day as the sun is beginning to set, causing me to race against the darkness. While the weekday walks are still enjoyable, they are not nearly as relaxing as my weekend excursions which have no competition from the setting sun. And though I walked the same path this morning, my experience was anything but typical. During the sunset walks, I do my best to lose myself in music while taking time to gather my thoughts. However, there is very little solitude at that time, as common courtesy dictates an obligatory nod of the head or an acknowledging smile to fellow walkers, joggers and other passersby. There is a palpable feeling of haste in the weekday air that simply does not exist early on a weekend morning, rendering the two experiences virtually incomparable. The water raining down from the fountain in the pond broke the silence of the morning as I rounded the bend in the path. As always, the ducks were gliding around the pond in pairs or small groups. And though the ducks keep a wary eye on people walking by if they are resting on the grassy shoreline, they don’t openly display any sense of alarm being in close proximity to humans. The same cannot be said for the swans that I saw by the pond for the first time this morning. While the ducks had very little reaction to me as I walked along the path, the swans took off in majestic flight as they felt my presence (unmenacing as it was). In a matter of seconds they soared across the pond to seek refuge on the other side. I marveled at the ease that it took for the swans to get to where they wanted to be, momentarily envious that we as humans are not afforded the same luxury. I thought about how we all must work tirelessly to get to where we want to be in life, while swans can seemingly get to where they want to be with great ease. Several minutes later, as I walked along the path to the other side of the pond, I caught up to the swans. Without hesitation, they took off once again in majestic flight, fleeing what they most certainly surmised to be imminent danger. The irony of the moment struck me. Although the swans have the innate ability to mightily soar to their destination, their destination is determined by their instinct to survive rather than their desire to thrive. Human beings, on the other hand, must toil to reach our destination, but the joy of arriving at our destination goes far beyond mere survival. The instant gratification mindset momentarily had me envious of the ability of the swans. But when the fleeting moment passed, I remembered one of my favorite Ralph Waldo Emerson quotes…“Life is a journey, not a destination.” Life isn’t always easy, but at least it is about more than just surviving (which is a lot more than I can say for swans and other members of the animal kingdom). Although I had already come to the realization that there is something to be said for living “without wings,” I enjoyed a not-so-subtle reminder as I watched the swans take flight. In true cinematic fashion, the swans soared away as the song “Anyway You Want It” by Journey pulsated through my headphones. The synergy of this serendipitous moment brought a smile to my face. Aside from thinking that life is a “journey” and that we have the ability to make our lives “anyway we want it,” hearing the song brought me back to my wedding day. As my wife and I walked back down the aisle towards the catering hall where our reception was being held, “Anyway You Want It” was playing in the background. To this day, one of my favorite memories of our wedding day is walking down the aisle for the first time as husband and wife, with Journey playing in the background as I kissed my wife’s hand. Thankfully, the moment was captured on film. Every so often, I come across something that I find truly moving and/or inspiring. Today was one of those days. Early this morning, I logged onto Facebook and scrolled through the usual plethora of updates. As I skimmed the page, I noticed a note posted by one of my friends from college…a fellow founding father of my fraternity (to be more specific). It’s hard to believe how quickly time has passed. I met this friend in my freshman year of college, but I’ve known him for almost twenty four years now (more than half my life). We lost touch after college, but have reconnected through Facebook (as so many of us have). While we haven’t seen each other in many years, I have no doubt that if we got together, we could easily just pick up where we left off. It seems to be normal for me to be able to do that. I’ve actually discussed this with a friend who I only speak to from time-to-time, and he feels that it is just the way that guys are wired. He may be right. The note that I read this morning was a eulogy that my friend gave to one of his lifelong friends who passed away recently way before his time. My friend mentioned how he had only spoken to his friend from time-to-time, but that they always just picked up right where they left off as if no time had elapsed whenever they spoke or got together. In his eulogy, my friend read a poem called “The Dash” (by Linda Ellis). The poem was written in 1996, and has since traveled the world and reached literally millions of people. When you read the poem, you can’t help but stop and take a moment to think about your life. Reading this poem today, I started to think about the losses that I’ve experienced…losses that have changed my life forever. In fact, Waldo2010 was launched in large part because of the painful reminder that I had recently that none of us is guaranteed tomorrow. It inspired me to make real and permanent changes in my life. I only wish that it didn’t take the tragic loss of a little girl named Olivia Grace Armand for me to have my epiphany. And spoke of the second with tears. What’s true and what’s real. In the coming month, I will be thinking about this poem as I remember my father on his birthday, and my grandmother on the one-year anniversary of her passing. March also marks the one-year anniversary of the passing of our family dog. All of these remembrances are just another reminder how quickly “the dash” goes by, and that we need to make every moment count. There is an old saying that goes…“reach for the moon… even if you miss, you will land among the stars.” The purpose of this message is to inspire people to strive to be their absolute best. It makes sense, but the message falls a bit short for me because it lacks a tangible goal. For motivational purposes, I find the idea of reaching for “the brass ring” to be much more meaningful because there is a specific, desired outcome. The challenge is to be able to grasp the brass ring amidst the slew of iron rings (which offer no reward). Many people are hesitant to reach for the brass ring because they don’t like to take risks that may result in failure. Those that do take risks do so because of the potential for great rewards. This is not to say that risk-takers have no fear of failure, because they absolutely do. The only difference is that risk-takers are willing to deal with the consequences of failure in their pursuit of the brass ring. Just ten days ago (in the Super Bowl), Sean Payton (the head coach of the New Orleans Saints), saw an opportunity to grab the brass ring by starting the second half off with an extremely unconventional on-side kick. It was, however, NOT a hasty decision. Payton saw something on game films that gave him confidence that the move would be successful. He could have very easily played it safe and stuck with conventional wisdom. If his team ended up losing the game, it would have been attributed to a number of factors, not the least of which being that the Saints were underdogs who weren’t supposed to win anyway. However, if the on-side kick failed, and his team lost the game, the blame would have been placed squarely on his shoulders. Payton saw the reward of a game-changing moment to be well worth the risk of being second-guessed by the masses for his bold decision. In the end, his calculated risk turned out to be the impetus that propelled the underdog Saints to victory. This is how legends are born! In a recent episode of the television show “House,” the hospital administrator was negotiating with an insurance company to receive a deal that was on par with the deals that larger hospitals were receiving. While the show is fictional, the situation is not unlike what happens in real-life negotiations. At some point, when negotiations have stalled, one party may issue a “take-it-or-leave-it” ultimatum. This virtual game of “chicken” is not without risk for the party giving the ultimatum, because they must be willing to live with the repercussions of their actions. The hospital administrator (in this case) was looking for a 12% increase across the board for payouts from the insurance company which 80% of the patients used. The insurance company was offering 4%. As the hospital administrator remained steadfast, the insurance company continued to gradually increase their offer. She could have backed down, taken a lesser offer and still have been looked at as a hero by the board of directors, but she didn’t. She held out for the full 12% and got it, largely because she believed that the insurance company needed the deal to get done as much as the hospital did. If the insurance company didn’t give in, the hospital administrator would most likely have been fired. In each these situations (both real-life and fictional), the person reaching for the brass ring took a risk. From an outsider’s perspective, it may have looked like a foolish risk, but that is because outsiders form their opinions with limited knowledge, while risk-takers do extensive research before making their decision to reach for the brass ring. There is a difference between reaching for the brass ring, and taking risks that are nothing more than uneducated hunches (also known as gambling). Gamblers tend to look at the “what if” after the risk has already been taken, whereas those reaching for the brass ring look at the “what if” before making a decision to proceed. In my own life, there have been times when my intention was to reach for the brass ring, but in retrospect, I was really just gambling. However, I have learned valuable lessons from each failure, which has lead me to where I am today. It is my nature to keep reaching for the brass ring, and while some may call me a “dreamer” or accuse me of having “pie-in-the-sky” expectations, it is fine by me. It helps to fuel my motivational fire, and inspires me to succeed. Nearly twenty five years ago, the caption underneath my high school yearbook photo read…“Dream on, dream until your dreams come true!” I’ve never forgotten it. In fact, I recently shared it with my son when the song where I got the quote from came on the radio. I wanted him to know that, while I’ve had my share of failures, I have not stopped trying to make my dreams come true. I also wanted him to know that he should never let others stand in the way of his dreams…or for that matter, his shot at the brass ring! Now that we have kids, our celebration is more of a family celebration. It’s fun because our kids are young and want to be around us. But I know that the time will come when they will want to spend Valentine’s Day with their respective boyfriends or girlfriends, so I try to make the most of things while I can. Cooking and cleaning have never been my strong suits, but I thought that it would be a nice gift to my wife, so I gave it my best shot. I had her go out with the kids yesterday so that I could clean the house while I prepared a special Valentine’s treat for the family. I only wish that there was video of me struggling to do the things that are second-nature to my wife. It would have made for entertaining reality TV. It started with my cleaning. I folded the laundry, but not nearly as neatly as my wife does it. I put things away as best I can, but it still didn’t compare to how my wife does it. I’ve always done a fairly decent job of vacuuming, but I did have some problems with the new vacuum that we have. I couldn’t get the hose with the attachments to work, but I finally figured it out. While I was doing my best to clean the house, I was baking brownies (to the best of my limited ability). I assumed that we had all of the necessary ingredients to bake the brownies when I bought the mix. I was wrong (or so I thought), so I ran back to the store to buy eggs. It turns out that there were eggs in the refrigerator all along, just not in the usual place. I swear, sometimes it seems that I am a visitor in my own home. Once I had all of the ingredients (2 eggs, ¼ cup of oil, ¼ cup of water and the brownie mix), I was ready to go. You would think that following these directions would be simple for anyone of at least average intelligence, but I felt myself feeling a little flustered, hoping that I wasn’t going to screw things up. I put all of the ingredients into the bowl and started to mix it with a whisk. Mistake #1! Not only was the batter not mixing well, but it was all getting stuck inside the whisk. I switched to a fork and got the job done (albeit with a much higher degree of difficulty than necessary). Then came the easy part (or so I thought). It says to spread the batter out on a pan after applying cooking spray. I had seen my wife do this with non-stick aluminum foil, so I decided to go that route, although I was a little panic-stricken making sure that I was actually using the non-stick side. With my aging eyes, I stared closely at the writing on the foil, and managed to get it right. However, I used the foil in a pan that happened to be out, not the pan that my wife usually uses. Mistake #2! So that’s why the batter didn’t reach the edges of the pan! I used a trick that I learned by watching my wife – put the brownie in the freezer for a few minutes to cool it off so that it is easier to cut. I put the whole pan into the freezer but it wouldn’t close. So I abandoned the pan and decided to put the brownie in the freezer with just the foil. As I picked up the foil by the edges, the amoeba-shaped brownie spilt right down the middle. Mistake #3! Apparently brownies are a bit more fragile than I anticipated. Although my brownie was starting to look very unappetizing, I wasn’t worried because I had planned to cut them into heart shapes anyway as a special Valentine’s treat for the family. 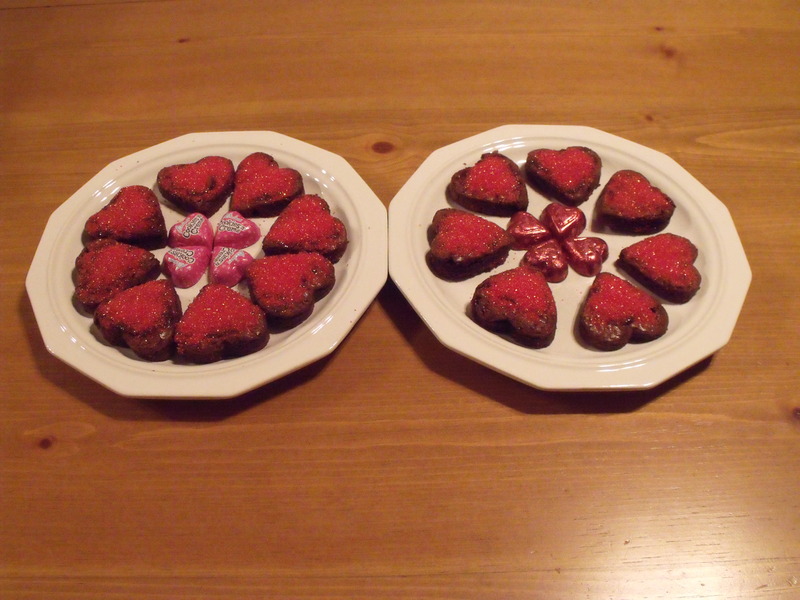 When I took the brownie out of the freezer, I was unable to penetrate it with the heart-shaped cookie cutter. Mistake #4! I guess my version of a “few minutes” is different than my wife’s, as the brownie was pretty solid by the time that I took it out. Thankfully, the microwave was there to fix this mistake, and I ended up with some decent looking heart-shaped brownies. This morning, I woke up before everyone to decorate the brownies with red sugar crystals to give them more of a “Valentine’s” look. The only challenge was figuring out how to make them stick directly to the brownies. Thinking like MacGyver, I put a drop of chocolate syrup on each heart-shaped brownie and spread it out across the surface. All things considered, the end result was pretty good (although it was a bumpy road along the way). I covered the plates with foil and left them out on the table. My little one was the first one to wake up this morning. She came out, saw the covered plates on the table and asked if the treats were for her. She also asked if they were brownies. I was thinking…how does she even know that there are treats under the foil, and why would she immediately assume brownies? Was she secretly watching me fumble my way through this process? I told her that they were a surprise for the whole family, and that we couldn’t open them until everyone was awake. A few minutes later, my son walked out. My daughter (without missing a beat) proclaimed “now we are just waiting for one more customer so that we can open our treats!” I laughed out loud at the concept of my wife being a “customer.” Thankfully, my wife didn’t sleep too late because the temptation of the treats was making my daughter crazy. It has been a fun morning. The family loved the special surprise, the candy and the little gifts that were exchanged. Valentine’s Day is much different when it is celebrated “family-style,” but I wouldn’t have it any other way! I’m sure that my wife would agree. Last winter, when we decided to move to Texas, we soaked up every ounce of New York snow. Although we were tired of shoveling it, and didn’t like driving in it, snow had been a part of who we were for our entire lives. We took pictures and video of the kids playing in the snow with a sense of guilt, thinking that they would no longer get to enjoy moments like these again. We were wrong! 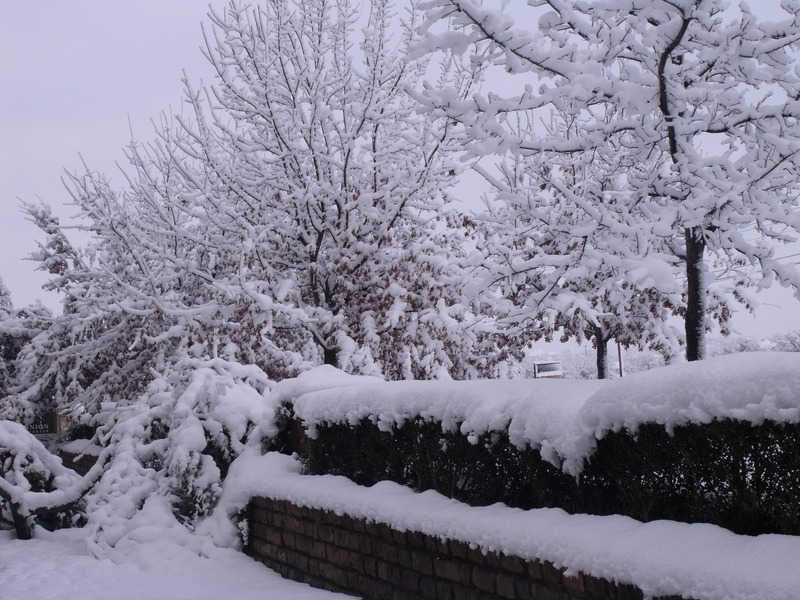 It started with a white Christmas (something that we rarely experienced in New York). There were only a few of inches of snow, and it didn’t last long, but it made the holidays feel more like home for us. As a native New Yorker, it was hard to imagine getting into the spirit of the holiday if it had been warm and sunny outside on Christmas. Since that time, there have been days that felt like spring in New York, but overall, the winter has felt pretty “normal” for us. It is funny how perspective changes. Texans seem to be somewhat traumatized by the winter that they’ve experienced so far, while I have reveled in it. The snow that I used to dread in New York is now a sight for sore eyes – partially because I don’t have to shovel it, but mostly because you don’t know what you’ve got until it’s gone. However, there have been some frustrating moments caused by the weather. School starts an hour earlier here, so getting my son up and ready is somewhat of a challenge. Despite my best efforts, I usually find myself having to deal with one issue or another with one of my children to get them out the door. Needless to say, the mornings on non-school days are much more relaxing than school day mornings, and they are something that I look forward to. About a month ago, I was driving my son to school, and there was no traffic leading up to the building. It was cold out, but there was not a flake of snow on the ground, so there was no reason for me to check for school closings before venturing out. Or so I thought! Apparently, the roads were a bit icy early in the morning when the decisions are made. As much as I like my son’s elementary school, their system for alerting parents of school closings failed me and the few other parents that ended up in the parking lot. A woman from Iowa who had also recently relocated was as perplexed as I was about the school closing. Yesterday, the snow was coming down hard, and it was already sticking to the ground in the morning, but no school closing. I kept checking the news and school website, but no mention of a closing. When we arrived at the school, it was a slushy mess. As the day progressed, the snow continued to fall at a rapid rate, making Texas look very much like New York in the winter. When I asked my wife about the possibility of early dismissal, she assured me that they would call us if that was going to happen. Apparently not! The school had been dismissed for nearly 30 minutes when we got the call to come and pick up my son. When I asked why I wasn’t notified, I was told that my phone must have been busy, and that the information was on the website. I said that our cell phones were not busy, and that I was not spending the day on the website checking for an early dismissal. When I arrived at the school, there were around ten kids waiting to be picked up. That seemed like a lot of busy signals to me (in the age of call-waiting). I’ve learned some lessons being in Texas for one of the snowiest winters in the history of the Dallas / Fort Worth area. First of all, the beauty of snow is in the eye of the beholder. Kids always like it, adults tend not to. I was one of those adults, until I thought that I wouldn’t get to see snow anymore, and then my opinion changed. People who grew up with snow appreciate seeing it around here, while native Texans long for their relatively mild winters. Next, it was reinforced that practice makes perfect. I was always amazed at how the snowiest regions of New York always seemed to have their roads cleared the fastest. Long Island always paled in comparison to upstate New York when it came to snow preparedness, but they are miles ahead of Texas, particularly in their school closing procedures. Finally, I have been reminded to appreciate the things that I have while pursuing the things that I want in the future, and not to take things for granted. Sometimes it takes losing something to realize how much it meant to you. I’m not saying that I miss the days of shoveling, but I do have a newfound appreciation for the joy that snow brings to children.